Though a tourist attraction, the Great Pyramid of Giza is a fascinating gem for archaeologists, who are still studying the tomb’s mysteries 4,500 years after it was built. Over the weekend, researchers announced the discovery of two previously unknown “cavities” in the pyramid’s northeastern edge and along its north face, suggesting the presence of hidden “passageways and chambers that have managed to elude archaeologists and looters alike for thousands of years,” according to Science Alert. 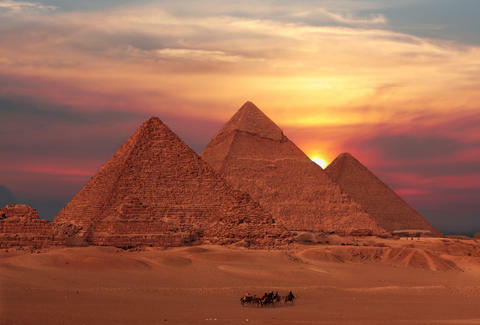 The group found this “void” through the use of muon particles, which work kind of like an X-ray, according to Mehdi Tayoubi, co-director of ScanPyramids. Tayoubi told Discovery News last year: "Just like X-rays pass through our bodies allowing us to visualize our skeleton, these elementary particles, weighing around 200 times more than electrons, can very easily pass through any structure, even large and thick rocks, such as mountains." That being said, researchers aren’t quite sure if these newly discovered cavities will necessarily lead to anything, or if they even exist. Scan Pyramids notes in its report, “the precise shape, size, and exact position of this void is now under further investigation,” and that researchers should have more intel by the end of October.